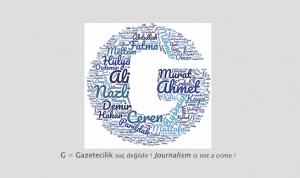 On 17 October, a platform initiated by Eurocadres (Council of European Professional and Managerial Staff) calling for an EU-wide whistleblower protection was launched by the first 48 signatories of a joint statement, including the European Federation of Journalists (EFJ). 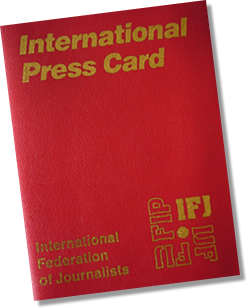 The EFJ is encouraging individuals and organisations to sign the petition. 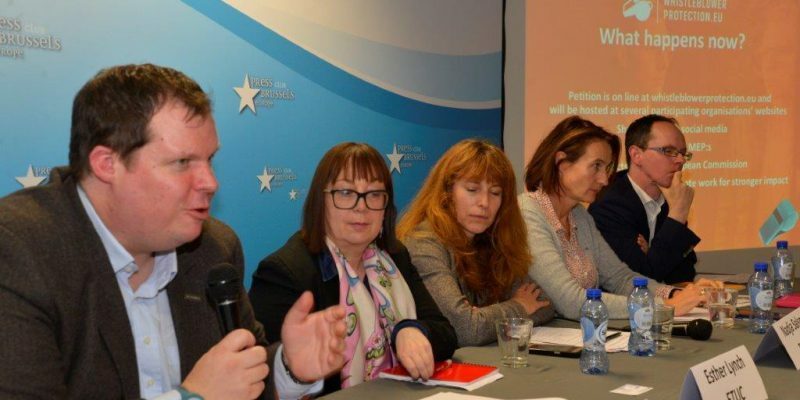 At a press conference at the Brussels Press Club , representatives of Eurocadres, the European Trade Union Confederation (ETUC), the European Federation of Public Service Unions (EPSU), Transparency International and the EFJ all emphasised the importance of joining forces on this crucial issue. Following the debate before summer of the trade secrets directive and the LuxLeaks trial, the lack of protection of whistleblowers at EU-level has come into sharp focus. Whistleblowers often risk ending up paying a high price for disclosing information. Yet whistleblowing can be essential in bringing to light – for exam ple – illegal activities, corruption, activities which are contrary to public interest and threats to public health and safety. The European Parliament is mainly in favor of a European legislation on whistleblowers. 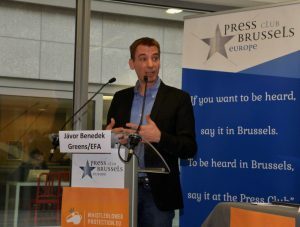 Greens MEP Benedek Javor is strongly supporting the action: “This is not a campaign for whistleblowers, it is a campaign for us, for the public”, he said during the press conference. 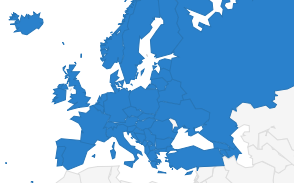 The S&D is organising a conference on EU action for whistleblower protection on 20.October. But the European Commission is still looking for the appropriate legal basis on which to base such EU action. EFJ director Renate Schroeder made the connection between whistleblower protection and press freedom and said that this issue goes hand in hand with the protection of journalistic sources: “We are proud of the recent leaks, LuxLeaks and the Panama Papers, because it showed the importance of investigative journalism and cross border cooperation, and they were only possible with the active role of whistleblowers.” She also referred to a study on whistleblowing protection laws at EU level by the Centre for Media Pluralism and Media Freedom (CMPF) showing that very few countries already have specific whistleblowing legislation. A video message of LuxLeaks whistleblower Antoine Deltour, sued by the Luxembourg court for disclosing information on tax rulings, was broadcasted. “It is important to have a protection at the EU level because the interpretation of the EU public interest can vary from a country to another”, he said. The press conference was live streamed on Twitter. In case you missed it, you can watch it on Periscope.